The bare display is available from WWW.EIO.COM for $99. You do need to supply a few DC power supply voltages and an interface to the ribbon connector. The EIO folks have a few different ways this can be done. Some seemed expensive and others seem to time consuming so I set out to make a single PC Board that would supply the 12, 5,-8 and 900 volts needed to fire up the display. What I came up with is a single board that mounts to the back of the monitor and in addition to supplying power it also brakes out the control pots so you can if you wish add them to you front panel. It also brakes out the RGB input and its control as well as the h/v drive outs. 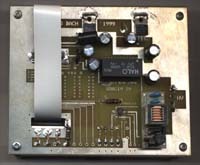 One feature I added was the capability to add an electronic high input impedance A/B switch option using a MAXIM IC chip. What I am offering here is an etched , drilled ,tinned and plated through G10 epoxy glass circuit board (you do have to cut the hole for the ribbon cable). And a limited supply of the -9 volt DC power module needed for this project.Because I do not make the boards (I just design it) I will have to wait for an order of eight of them before I have the made. E-mail me for more info. The neg 9 volt power modules will go for $10 each , only sold with the boards! With the board you will get a schematic and layout so you can assemble it. All of the parts are available from Digi-key for around $30 except the -9 volt module and maybe the MAXIM A/B chip. This is a pic of the PC boards CAD drawing, click on it for a bigger one. This is a bank board just as you will get it, note the lack of the ribbon hole. 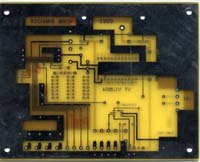 A finished PCB mounted on the back of the display, note the ribbon hole. This is a side shot from the high voltage end, note the stand offs soldered to the panel and how the high voltage module (upper left of photo) is soldered above the PCB. If you click on the pics you will get a larger but slower image, use your back button to get back to this page.As you can see the board is made to mount directly on the back of the display. This is accomplished by attaching 4 half inch 6-32 tapped tin plated brass spacers to the blank circuit board with 4 6-32 x 1/4 inch machine screws( the heads can be seen in the corners of the finished pic) these holes can be seen in the blank PCB pics corners. Next take the bare LCD and bend the high voltage plug leads and the black plastic spacer strait up right at the edge of the plugs PCB so they stick strait up, this will connect the high voltage from the PCB to the cold cathode lamps. Next place the board and spacers on the LCD module so the spacers line up with the holes in the tin cover on the back of the bare LCD panel and make sure the HIGH voltage connector lugs line up with the holes in the PCB labeled "HV" but do not solder them yet! now vary carefully and quickly so you do not melt the display moduals plastic solder the spacers to the tin cover, use a large gun or big iron for this , you want a lot of heat for a short time to do this right. Now remove the machine screws and take the board off the LCD panel, now set the panel aside. Now to prep the board for parts installation. Locate the section of the blank board that the ribbon will have to pass through , this is vary odveous in the finished PCB pic and can be seen in the blank PCB pic as the small rectangle in the lower left side and can be seen in the CAD pic in the same location. Use this etched out rectangle as a guide to cut out the hole for the ribbon cable , cut it out using a Dremmal or similar tool and a file to get the edges smoothed out. If you have done all this correctly you can dry fit the board back on the LCD panel and the hole will line up with the ribbon connector on the panel. Now it is time to fill the board with parts. There is no specific order you must follow but I like to go with the smallest parts first and I would recommend the first part to be soldered be the 1mm ribbon connector on the PCB, It is the most difficult part to line up and is easiest done with out any thing in the way. This connector can not be seen in the photos because the ribbon is in the way. I will put an arrow pointing to it on the large pic of the blank board. This connector will be oriented with its open end to the top for the board and the solder tabs towd the bottom. In addition to the connection tabs there are two tabs for holding the connector mechanically in place these are located one at each end and after you line up the electrical connections and solder them you can solder these machanincal lugs to the ground foil for support. Please note that pin #1 (if you count from left to right on the PCB with it oriented as the photos have it , pin 1 is left& 20 is right ) Is soldered to the ground foil ,so use pin #20 to line up the connector with all the pins . make sure this is as perfect as you can get it these contacts are 1mm spaced and you will have to use a small low wattage soldering iron to make these joints. If you are not good at soldering get some one who is to do this component ,it is the most difficult of the project. follow the parts lay out that comes with the board for the rest of the parts, it is a breeze , just like the old heath kits. If you do not need the A/B video switch you can put a jumper on the board and it will be a one input unit .You do not have to use the external pots if you do not wish to or you can use just the ones you need . You do not have to use the RGB ins or hook up its control if you do not need it , it was put on the board encase some one would need it. Now for testing .If all is correct place the now complete board on a non conductive surface and hook up a 13.8 volt dc power supply to the ground foil and the +DC input of the board. BE CAREFUL THE HIGH VOLTAGE MODULE WILL DELIVER 900 VOLTS AT 5ma AND CAN HURT OR KILL YOU IF YOU TOUCH IT!!!! With a good digital DMM check the output of the 5volt regulator and the 12 volt regulator. If all is correct now VARY carefully check the output of the HIGH VOLTAGE section by measuring betrween the ground foil and each one of the two high voltage outputs it should be near 900 volts AC.The last supply to check is the negative eight volt supply, if you bought a HALO module from me or another source you know it puts out -9 volts but I placed a diode in series with this module so we will get a 0.7 to 0.9 volt drop across the diode giving us 8.1volts to 8.3 volts , this is close enough to work fine but you must put a small load on it to check it .Use a 1k ohm resistor for this. If you really want to be safe you can check to make sure all the voltages make it to the correct pins of the twenty pin connector so you do not blow up the display!!! Now for final assembly and check out. Put the long 20 pin 1mm ribbon cable you get from Digi-Key in the module instead of the short one , note which way the contacts face, Insulated side facing the barcode.Place the completed PCB on the prepped display module , run the ribbon through the hole in the board you cut earlier and screw down the PCB using the 6-32 machine screw, once again be sure the high voltage leads line up with the holes. Now carefully put the other end of the 20 pin ribbon cable in the connector on the PCB note the insulated side is on the board side and the contact side faces up, you should not have to twist the ribbon. Now solder the four HIGH VOLTAGE leads to the PCB.You can now test the assembly by hooking it up to the 13.8 volt power supply and the first thing you should see is the cold cathode back lite come on , if it dose not check your work again. Now put video into the appropriate input and you should see it on the display!! You will note at this point you do not have any control of the image. If you want or need such control just add the pots needed and all should work fine. Good luck and enjoy the new toy. please note the mirror sites!! !